Blood group systems are necessary to identify suitable products for transfusion. The frequency with which alloantigens and alloantibodies occur, which may be different among ethnic groups. The functional characteristics of alloantibodies: thermal range, immunoglobulin class, titre, avidity and ability to fix complement. The presence of autoantibodies that are relevant to the diagnosis and management of autoimmune blood disorders and that may interfere with compatibility testing. ABO is the most important of all the blood group systems. 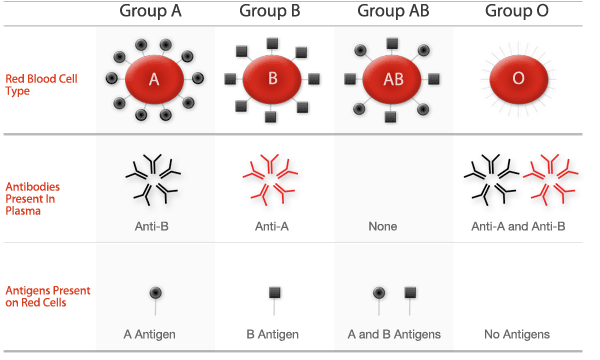 There are four different ABO blood groups, determined by whether an individual's red cells carry the A antigen, the B antigen, both A and B antigens, or neither antigens. Normal healthy individuals, from early in childhood, make red cell antibodies against A or B antigens that are not expressed in their own cells. These naturally occurring antibodies are mainly IgM immunoglobulins. They attack and rapidly destroy red cells carrying the corresponding antigen. For example, anti-A reacts with red cells of Group A or AB, and anti-B against red cells of Group B or AB. If ABO incompatible red cells are transfused, immediate red cell lysis can occur. For example, if Group A red cells are transfused into a Group O recipient, the recipient’s anti-A antibodies bind to the transfused red cells. An ABO incompatible transfusion reaction is an acute haemolytic transfusion reaction. This reaction can lead to overwhelming haemostatic and complement activation and result in shock and renal failure. Stopping the transfusion, following the steps for managing a suspected transfusion reaction and immediate volume resuscitation is imperative. At present, the Rh system comprises 61 antigens, (1) however new antigens continue to be discovered. The Rh antigens are located on the red cell membrane protein. The D antigen is the most immunogenic and important Rh antigen, followed by c and E. Routine Rh typing of donors and patients only test for the presence/absence of the D antigen. The presence of RhD antigen on red cells confers Rh positivity; while people who lack RhD antigen are Rh negative. Exposure of Rh negative individuals to even small amounts of Rh positive cells, by either transfusion or pregnancy, can result in the production of Rh antibodies which are mainly IgG type. Haemolytic disease of the fetus and newborn (severe cases with anti-D and anti-c and mild to moderate cases with anti-C, anti-E and anti-e). Daniels G et al. The clinical significance of blood group antibodies. Transfusion Medicine 2002;12:287–295. Reid ME et al. Summary of the clinical significance of blood group alloantibodies. Semin Hematol 2000;37:197–216.